In 1821, C. H. von Nagel began studying theology in Tübingen, and in 1825 he finished there and became a clergyman. During the four years, he attended lectures in mathematics and physics by J. G. von Bohnenberger and F. J. P. Riecke at Universität Tübingen. In December, 1826, he became a teacher of mathematics and natural science at the Lyceum and Realschule in Tübingen, and continued his studies in mathematics at the university. By 1830, he had received the Ph.D. degree, having written his dissertation, De triangulis rectangulis ex algebraica aequatione construendis, under the direction of von Bornenberger, and was appointed a Privatdozent in mathematics at Universität Tübingen. Beginning in 1830, Nagel served as Professor of Mathematics and Natural Science at the Gynasium (e.g., high school) in Ulm. In 1840, he wrote a 400-page book entitled Die Idee der Realschule, nach ihrer theoretischen Begrundung und praktischen Ausführung dargestellt. Loosely translated, "Realschule" means "science school" or "modern secondary school". In 1844, Nagel became Rector of the Realanstalt Ulm (i.e., the Realschule in Ulm) and after 25 years' service as Rector received the honorary title, Ehrenbürger von Ulm. He retired in 1875. Peter Baptist, Die Entwicklung der Neueren Dreiecksgeometrie, Wissenschaftsverlag, Mannheim, 1992. In one of Nagel's publications, existence proofs are given for the points now known as Nagel point, Gergonne point, and Mittenpunkt. 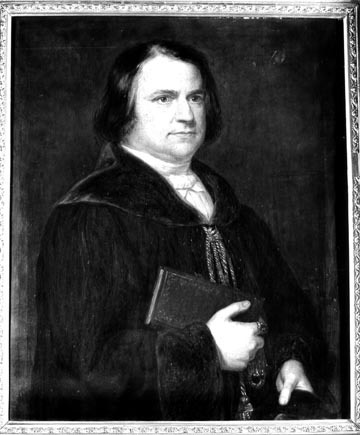 I thank the Ulmer Museum for providing the portrait of Nagel, painted by Johannes Friedel in 1847.